1 November 2012, 7:28 PM. Hurray! Chapter…What is this, three? Right? No? It’s six? Just kill me now. “Max?” The Gasman’s voice was very young and very scared. What’s that? They’re not, you say? You mean that the Erasers just took Angel? And just left the rest of the flock just lying unconscious? Yup, we have our plot hole, which I touched on in the last chapter. These scientists are smart enough to creat bird kids and Erasers, yet they’re too stupid to figure out that if you leave the rest of the flock just lying there, they’ll probably get pissed and start a rescue mission? I mean, the Erasers could’ve probably dragged the rest of them into the helicopter. Max cries for a little while about why couldn’t it be me, at least I would’ve stood a chance, which is apparently standard-issue characterization when someone you love is captured. Look! The “scientists” rubbed their brain cells together and created a thought! If you have to pick one person to kidnap, don’t take the strong one because they’ll fight back! What a concept! So the flock’s a little beat-up, but otherwise okay. Even Nudge, who was swung into a tree. Guys, I can’t repeat this enough. They picked her up and swung her into a tree. That’s really gotta hurt. Just then Iggy cocked his head slightly. It was a clue for me to start listening intently. Then I heard it too: A faint engine noise. Reading ahead, it turns out that the Erasers are driving a Humvee. If Iggy can hear that, why couldn’t he hear the helicopter that the Erasers dropped out of? The blind guy is — Nevermind. I can’t wait for this chapter to be over. (Actually, the blind guy runs through a forest without hitting a single tree. I’m not sure about his blindness, but I can assure you that hearing does not work that way. You can hear your friends running too, but only their general direction. I imagine that they’d be weaving and bobbing around trees and why am I even explaining this when it’s just so stupid? So Max jumps off a drop-off right over the car. She’s going to get Angel back, oh my! Which would’ve been excellent six chapters ago, when we first established that she had wings. You see, that nightmare I had is actually hard to tell apart from my real life. I hadn’t noticed, Max. Tell us more, please. We were bird kids, a flock of six. And the Erasers wanted to kill us. Now they had six-year-old Angel. This…doesn’t make sense. It sounds like Patterson started to type something about there only being five of them left and forgot to finish the sentence. Blah-de-blah-de-blah. Max tells us things that she established in the infodump prologue, and then we learn that Jeb worked at the School but kidnapped them away. Right, so he left his job and son to go live with the bird kids. At least this explains how he got the money — I imagine that the “evil scientist” paycheck is significantly larger than the average Joe’s. But where he came up with the time to build the house, I have no idea. I gave a strong push down and then up, feeling my shoulder muscles working to move my thirteen-foot wingspan. And the award for best infodump interrupting a critical moment goes to…! Guys, let’s LOGIC for a minute and figure this whole thing out. So I don’t know if the Erasers have been trained to fire guns or not. I imagine that they have, assuming that they were given rifles and whatnot. If you want someone to do a job for you, better make sure that they do it well, huh? So, anyways, the trees behind Max are being hit with bullets. Bullets are flying through the air. BULLETS EVERYWHERE. And not a single one hits Max. On a normal human, I’d mark this off as “plausible suspension of belief”, because maybe humans are kind of tiny and it’s a moving vehicle and all, but we need to think. Had one of the Erasers focused on shooting Max’s wings, she would’ve been toast. That’s all it would’ve taken. And Max has some pretty large wings, too. We just got a huge infodump on them. But she doesn’t get hit. Because LOGIC. So the Erasers start throwing grenades too and they still can’t hit anything because Max’s Protagonist Powers have formed a force field around the flock. He jumped in behind, an incredible athlete himself. It’s a little-known fact that Max can also read minds. In all seriousness, how would Max know this? I’m assuming that Max only knew Ari from the School. In a cage. Right, Max grabs onto the chopper and Ari points a gun at her while still not shooting her. We all have great vision — raptor vision. No. No you don’t, Max. Because guess who else you forgot? It couldn’t be Iggy, could it? So Max gets kind of overwhelmed and just leaves the flock sitting there to go punch a tree or something. She punches the tree, I mean. The rest of the flock just kind of sits there and waits because it’s not like they’re in danger or anything. It was like I had lost my little sister. And like I had lost my little girl. So, if you read the monologue prologue, you’ll remember that Max talks about her family and how they’re like her siblings even though they’re not related or something like that. So, um, [Losing my little sister] was like I had lost my little sister? Also, Max really needs to cut the snark. Sometimes, it’s just not appropriate. So Max punches things for a while and then she cries. Maybe it would be a halfway-decent representation of grief. But I don’t care. Really, I don’t. Or, more accurately, I can’t. Because I hardly knew Angel. She got maybe three or four lines at the most and I’m expected to get all sad when she is kidnapped? Meh, this scene kind of reminds me of learning that a distant relative has died. You vaguely remember them from family reunions, but you were so little that you didn’t really know them. And you just kind of go “Oh,” because, sure, it’s sad, but you barely even knew the person. That’s what this chapter is like. So they make it home, which is kind of stupid because the Erasers know where they live. But whatever. Iggy hits a coffee mug and it almost hits Fang. “Watch it, you idiot!” [Fang] yelled at Iggy furiously. Then he realized what he’d said, clenched his teeth, and rolled his eyes at me in frustration. First, I can tell that Fang is furious. He’s yelling. “You do not need to use adverbs to spell things out to us,” Azure sighed impatiently. Second, that is the most idiotic action I’ve seen in a long time. I can’t even imagine this without snickering. “You watch it!” Iggy shouted at Fang. “What happened? I mean, you guys can see, can’t you? Why couldn’t you get Angel? This is from the guy who pointed out where the Erasers were going with Angel in the first place. He knows exactly what happened. Pull up a chair. Get comfy. We need to talk. Guys, I really don’t like the way Patterson treats Iggy. I feel like he’s only blind when it’s convenient for Patterson. In twenty-seven pages, it’s been mentioned that Iggy’s blind exactly twice. In twenty-seven pages, Iggy has been affected by his blindness zero times. If anything, he’s an asset to the group. I mean, Iggy’s one of the last to go down in a fight. He can run through the trees and dodge bullets, no prob. But the second Patterson needs character development, he reminds us that Iggy’s blind and then he’s allowed to feel sad and we’re supposed to feel sad with him. Iggy’s blindness adds nothing to the plot except as a deus ex machina for situations that Patterson couldn’t back out of. If anything, he’s just a token character. Blindness is his defining characteristics for most of the book, only it never affects him. That’s not how writing works, Patterson. If a character is disabled, it isn’t just at your convenience. Blindness is not equal to character development. No disability is. So then Nudge monologues about how the plot Erasers want them alive, which is something that we figured out three chapters ago. And they’re going to go to the School to get Angel. Dramatic music plays and we fade out to a commercial. So everyone gasps and is very surprised/scared of this information. You can just hear Patterson going “Dun dun DUNNNN…” as he types it. When he’d been at the school, they’d tried to surgically enhance his night vision. Now he was blind forever. Oops. What did I tell you, Max?! Cut. The. Snark. It just sounds so callous, especially if you’re talking about how someone lost his sight. I just drove this spork through Max’s heart. Oops. “They took Angel to the School?” the Gasman asked, confused. Obvious dialogue descriptions should be eliminated. I am aware that he is confused, Patterson. God, there is just so much wrong here. This chapter is basically a huge infodump of things that the flock should’ve known. I just feel that it could’ve been so much smoother than it was. On a side note, I kind of liked how Max talked about how they tried to forget their time at the school. Again, she injected too much snark into it, but it made sense, what with the trauma that they’d been through. So they pull out a map from Jeb’s old stuff and the School’s in California. And the chapter’s over. So obviously Patterson’s settling into a sort of rhythm here with the chapter length. He could do with a lot better characterization. We’re ten chapters in, and I barely know anything about the characters. He also needs to tone down Max’s snark a lot. There are some times when it’s obvious that he thinks he’s being so clever, but it’s really not funny, and, in some points, not even appropriate. I’m also getting the feeling that these chapters were dashed off in about ten minutes. They read more like a first draft than a published book. Next up: We fly around a bit, exit Part One, and realize that Patterson really has no idea what he’s writing. 1 And it’s not like we already didn’t know this. 2 Seriously, the kid is (technically) seven and I’m getting a creepy romantic vibe off of him? Enough YA novels for me. 3 Seriously, where did he think they were taking her? Wow…this is so much worse than the graphic novel version. Then again, it has been awhile. But it’s still worse. feeling my shoulder muscles working to move my thirteen-foot wingspan. She’s working those enormous wings with her shoulder muscles, not even with her chest? Christ, that would only work if she looked like one of those Rob Liefeld neckless monstrosities. No wait, too much chest. This whole story so far reads like the stuff I wrote when I decided to try NaNoWriMo one year. Not a single sentence has seen the light of day. On a side note, I admit I’m not super familiar with Patterson’s work, but it looks like he writes mostly thrillers. I’m not seeing much fantasy/sci-fi/YA listed under his name until recently. I don’t know what his rationale was for that decision. Did he decide to cash in on the YA fantasy craze? Did he suddenly think that millions of dollars makes him the next Stephen King and hey, if the King can write fantasy and horror, then Patterson can write sci-fi and thrillers! Or did he just want to branch out a little? Whatever the case, I think he should have stuck to thrillers. His sloppy approach to the fantastic elements in this story show a clear lack of respect for the sci-fi genre. 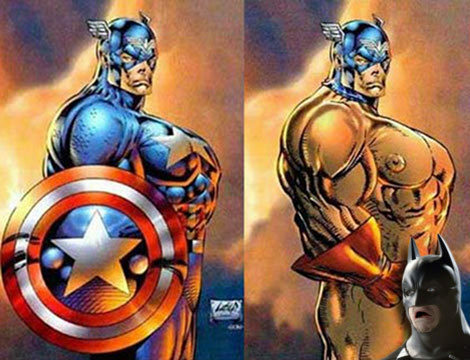 swenson, I’d say Cap’s moobs are horrifying, but those aren’t really moobs. They’re more….more….more Lovecraftian horror than anything else. a clear lack of respect for the sci-fi genre. No kidding. Sci-fi is more than just things that don’t make sense plus generic storyline plus some handwaving about DNA or mutation or experimentation. Good SF takes a lot of work and a lot of thought to pull off. so MAx punchs a tree. Did she get wood blocks from it? Sci-fi is more than just things that don’t make sense plus generic storyline plus some handwaving about DNA or mutation or experimentation. In particular, I’d say that sci-fi typically expects the author to at least maintain coherent internal logic regarding its fantastical elements (same as fantasy expects a consistent magic system), with the added onus of at least pretending it could work in the real world. There’s plenty of great sci-fi out there where the internal logic doesn’t make any real-world sense (Iron Man’s arc reactor, for example, or randomly creating new elements both for Iron Man and Captain America), but then they have to stay reasonably consistent after that point (and be interesting). Maximum Ride fails that pretty hard. Toph Bei Fong points at things all the time and she is convincingly and realistically blind. Her excuse, however, is that she can feel the vibrations of someone running across the ground through her feet, not just hear them. Still, I think Iggy pointing in the general direction of where the enemy is could be justified. Just wait until they get to the crowded cities and sometime in book four when Iggy is identifying colors. The idiocy hasn’t even begun yet. Be glad you’re writing this stuff down. Patterson clearly didn’t write anything down when he was working on the story. Some fanfics are written better. How did this tripe get published? Le sigh. And swenson, that pic of Captain America is TERRIFYING. I agree. Ugh, what was that artist thinking? He can see when things are against a white background in book four because reasons. Also, I think he can feel colors or something. He’s totally blind until the fourth book. His seeing in that book does not make any sense. Oh, that’s nothing compared to what happens if you try to draw him under the shield (not really safe for work). 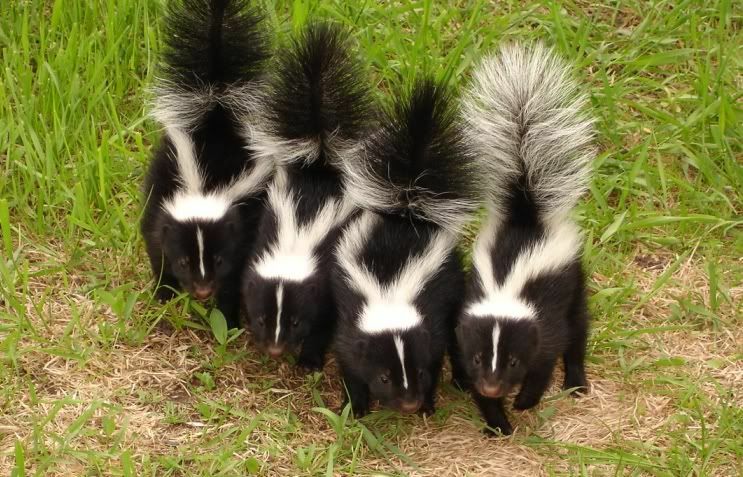 To clear your mind of that horror, here are some skunks. I don’t think that’s enough cute to clear our minds, Tim. I feel like he’s only blind when it’s convenient for Patterson. Hm, I don’t know why, but despite all of the Informed Disability and stuff, Iggy seems to be the only one I actually like. Maybe because he doesn’t seem as stupid as the rest. Or because he reminds me of a bat. I think we’ll need a ringtail cat, too. 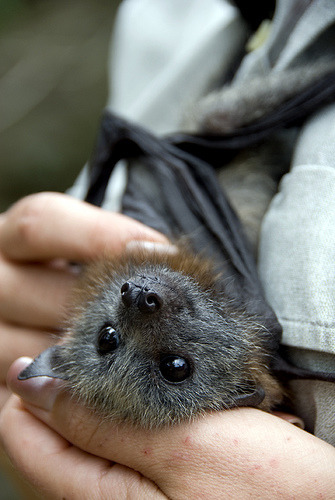 D’awwwww :D The cute animals have cleared my mind. Toph Bei Fong not only has the excuse of being an Earthbender, she is also an excellent character from an excellent TV show. Iggy actually made me think of her, because of his “hearing” thing. I have to say that I don’t dislike Iggy, despite his informed disability. Then again, I don’t dislike any of them except Max because I don’t know enough about them.